Construction of a new segment of the Westside Regional Trail is in progress, marking the first step toward completing the trail north of US Highway 26. When complete, the one-mile long, 10-foot wide segment of shared-use trail will connect the Rock Creek Regional Trail at its north end to Kaiser Road at its south end. The trail is being constructed almost entirely within the Bonneville Power Administration (BPA) power line corridor, and will include a connection to Hansen Ridge Park as well as connections to adjacent neighborhoods and improved access to Kaiser Woods Natural Area.. The project has been split into two parts in order to complete a portion of the trail sooner. Construction of the trail portion north of 147th Avenue (147th Ave north to Rock Creek trail connection) is now complete and open to the public! 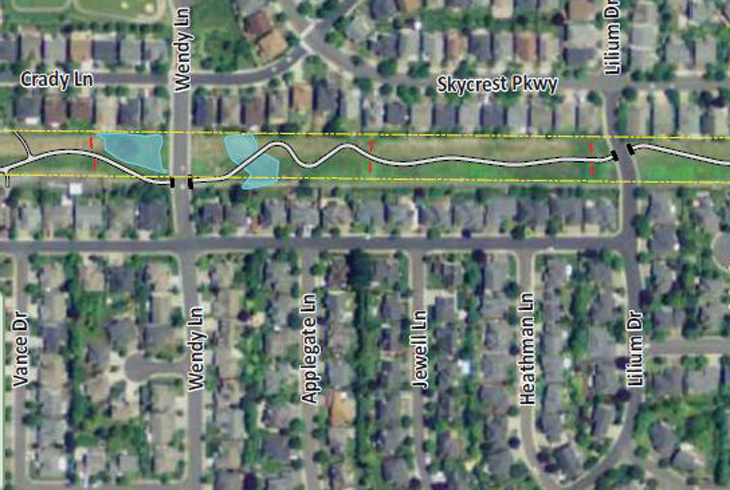 Construction of the trail portion south of 147th Avenue (147th Ave south to Kaiser Road, and connecting to Hansen Ridge Park) reconvened in mid-July 2018. The trail has been re-designed to incorporate more boardwalks instead of trail embankment through the Bronson Creek wetland area in response to the wet subgrade conditions that were encountered during summer 2016 construction. The trail alignment has not changed. At this time, the southern portion of the project is expected to be completed in the winter of 2018/19. More updates will be provided as they become available. We thank everyone for their patience as we work to complete this exciting trail project! Please pardon our dust! Contractors will be performing site preparation and grading activities throughout the summer of 2018 in preparation for the trail and boardwalk improvements to be completed during the fall/winter of 2018/19. Tree and brush cutting and clearing, surveying and delineation of the trail corridor may continue without notice until the trail is completed. No earthwork activities will be performed during wet weather months from October 1 through May 31. During construction, trail closures may occur as necessary to ensure public safety. Signage will be posted at these locations to help guide trail users around the construction area via alternate on-street routes. Closures will be in effect until trail work is completed and trails are open to the public. For project-related comments or questions, contact Rob Russell via email or online via the THPRD web contact form. In 2008, THPRD applied to Metro for Metropolitan Transportation Improvement Program (MTIP) funds to assist in the design and construction of Segment 18. In 2009, THPRD was awarded $2,399,337 for the project, administered by the Oregon Department of Transportation (ODOT). THPRD worked closely with ODOT to select David Evans & Associates (DEA) as the design consultant for the project. Master planning, design development/engineering and permitting took nearly four years to complete. Based on site constraints and neighborhood input Staff and consultants refined the alignment and presented the preferred master plan alignment to the THPRD Board of Directors; it was approved on February 4, 2013. Final construction plans were completed in summer 2015 and the project was bid in September 2015. Please note that all plans are subject to change. In order to complete sidewalk and ADA improvements at each of the four trail crossings at public right-of-ways on Westside Trail segment 18, crews will need to close several sidewalks to public access for up to four weeks this fall. Construction of a new segment of the Westside Regional Trail is scheduled to begin in February, a first step toward completing the trail north of US Highway 26.